Discover your options for treating Head & Neck tumors with CyberKnife in Los Angeles, CA. Any diagnosis of cancer can be a shattering and life-altering one. At the Pasadena CyberKnife Center, we understand, and that is why our tumor and cancer treatment center near Los Angeles is based not only on the most effective, cutting-edge treatments for cancer, but also compassionate care and understanding of our patients. We offer completely non-invasive robotic radiosurgery treatment for head and neck cancer in Los Angeles which has proven to offer long term positive outcomes and successful elimination of tumors. Ours is the only center in Los Angeles to offer Full-Body Stereotactic Radiosurgery treatment with the CyberKnife VSI model. The treatment of head and neck cancer typically involves a detailed evaluation and a multidisciplinary team of professionals to formulate effective treatment. The CyberKnife Robotic Radiosurgery System improves on other radiosurgery techniques by eliminating the need for painful and invasive stereotactic head frames to be attached to a patient’s head with screws or bolts. Instead, it uses a soft mesh mask that is custom-fitted to the patient’s face. The CyberKnife System can pinpoint a tumor’s exact location in real time using three dimensional x-ray images and ablate the tumor with unparalleled accuracy, without surgery, hence called Radiosurgery. Cyberknife’s unique robotic design can treat cancers and tumors in the head and neck area, from virtually any angle, giving a proven, effective method for treating even inoperable patients. While standard radiotherapy irradiates both normal and cancerous tissues, CyberKnife delivers an ablative dose to the tumor with sub-millimeter (.3mm) accuracy and minimal exposure of normal tissue. Patients experience short, painless treatments with far fewer side effects, limited (if any) downtime and an immediate return to activities. CyberKnife can treat patients who can’t endure head and neck cancer surgery or who have a high risk for postoperative complications. Treatment occurs in one to five short sessions, after which patients can immediately return to their regular lives. After completing the CyberKnife radiosurgery treatment, it is important that the patient schedule and attend follow-up appointments. Response to treatment varies from patient to patient. Clinical experience has shown that most patients respond very well to CyberKnife treatments for head and neck cancers. As follow-up, Radiation Oncologists at the CyberKnife Center will monitor the outcome in the months and years following the treatment, often using either CT scans and/or PET-CT scans. Get in touch with us to learn more about head and neck cancer treatment in Los Angeles and to know your range of options given your particular condition, symptoms, and circumstances. 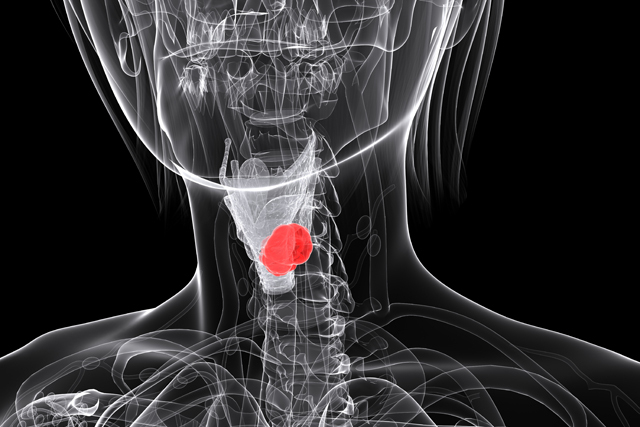 We can also tell you about head and neck oncology and learn about the treatment procedure. Learn more about head neck cancer treatment options and also about your options for treating prostate, liver, and kidney cancers and non-cancerous conditions such as Trigeminal Neuralgia and Arteriovenous Malformation. Request a phone consultation, at 626.768.1021, use our contact form to ask a question or fill out a Patient Form and then come see us for a personal consultation at our premier head and neck cancer treatment center in Los Angeles. Pasadena CyberKnife’s sub-millimeter (.3mm) head and neck cancer treatments are performed on an outpatient basis in one to five days, requiring no overnight hospital stay and without the use of the rigid stereotactic head frame, as is required by Gamma Knife. Patients can experience minimal to no side effects with a quick recovery time. CyberKnife requires no bolt-on head frame as is REQUIRED by Gamma Knife. The CyberKnife® Robotic Radiosurgery System was cleared by the U.S. Food and Drug Administration in 2001 to treat tumors anywhere in the body, including the head and neck area. Despite its name, the CyberKnife System is not a surgical procedure. In fact, Cyberknife is completely non-invasive. The CyberKnife System delivers high doses of pin-point radiation directly to cancers and tumors of the head and neck. CyberKnife Radiosurgery offers patients new hope for recurrent head and neck cancers as well as for those who cannot undergo surgery due to their poor medical condition, or who refuse surgery, a non-invasive alternative treatment for removing tumors. At the Pasadena CyberKnife Center, we’re innovating treatment of head and neck tumors by effectively removing and shrinking localized, solid-mass tumors with Cyberknife Radiosurgery. The CyberKnife Robotic Radiosurgery System improves on other radiosurgery techniques by eliminating the need for stereotactic head frames to be attached to a patient’s head with screws or bolts. As a result, the CyberKnife System enables doctors to achieve a high level of sub-millimeter accuracy in a non-invasive manner and allows patients to be treated on an outpatient basis. The CyberKnife System can pinpoint a tumor’s exact location in real time using three dimensional X-ray images taken during the tumor treatment and ablate the tumor with surgical outcomes, yet without surgery, hence called Radiosurgery. The CyberKnife System has a strong record of proven clinical effectiveness. It is used either on a stand–alone basis or in combination with other head & neck cancer treatments, such as chemotherapy, surgery or radiation therapy. Cyberknife’s unique robotic design can treat cancers and tumors in the head and neck area (and the entire body), from virtually any angle, giving a proven, effective method for treating inoperable patients that have unresectable and marginally resectable tumors. While standard radiotherapy irradiates both normal and cancerous tissues, CyberKnife delivers an ablative dose to the tumor with sub-millimeter (.3mm) accuracy and minimal exposure of normal tissue. As a result, Pasadena CyberKnife Center can treat inoperable patients, shrink tumors for less radical resections, destroy radio-resistant tumors and treat patients previously treated with radiation. In addition, CyberKnife patients experience short, painless treatments with far fewer side effects, limited (if any) downtime and an immediate return to activities. CyberKnife treats localized solid mass tumors – CyberKnife is effective in nonsurgical treatment of certain metastatic head and neck cancer or tumors that need to be treated for palliative reasons. CyberKnife is non- invasive – CyberKnife can treat patients who can’t endure surgery or who have a high risk for postoperative complications. CyberKnife is effective – Far less risk, side effects, recovery period, pain, scarring and hospital stay than surgery. CyberKnife Is Precise – CyberKnife’s submillimeter precision means we’re able to destroy or shrink tumors near to or involved with critical structures. Cyberknife is painless and convenient – CyberKnife, treatment occurs in one to five short sessions, after which patients can immediately return to their lives. 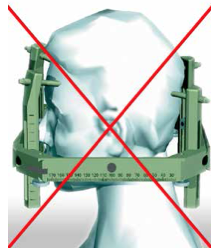 Unlike other radiosurgery systems – such as the Gamma Knife – the CyberKnife System does not require patients to be fitted with a rigid and invasive head frame. In the set-up stage, the radiation therapist will create a soft mesh mask that is custom-fitted to the patient’s face. This comfortable and non-invasive mask helps the patient keep his or her head and neck immobile during treatment. While wearing the mask, a CT scan will be performed. The CT data will be fused with other image data sets such as MRIs or PET scans. These fused images sets will then will be used by the CyberKnife team to determine the exact size, shape and location of the tumor. After the tumor treatment plan is developed, the patient will return to the CyberKnife Center for treatment. The Radiation Oncologist may choose to deliver the treatment in one session, or stage it over two to five days. All, head & neck cancer treatments are completed within five days. For most patients, the CyberKnife treatment is a completely pain-free experience. Patients dress comfortably in their own clothes and, depending on the treatment center, they may be allowed to bring music to listen to during the treatment. Patients also may want to bring something to read while they wait, and have a friend or family member with them to provide support before and after treatment. For more information on CyberKnife’s ability to treat Head & Neck Tumors, check out our Case Studies.